Expatriate NZ author Peter Walker has begun his tenure as writer in residence at Randell Cottage in Thorndon, Wellington, and in one month has written nearly 15,000 words of his new novel. Walker works as a journalist in London, and is the author of the historical memoir The Fox Boy (Bloomsbury 2001) set in Taranaki, and a novel, The Courier’s Tale (Bloomsbury 2010), set in the court of King Henry VIII. He is using his six months in Randell Cottage to work on a novel provisionally entitled The Watcher’s Diving, which is set in New Zealand, the US, India and Lebanon. Within a day of arriving at Randell Cottage he’d settled in at the writing desk looking out at an original rose planted by the Randell family in the late 1800s. He’s also enjoying reconnecting with Wellington. ‘It’s a small city but it’s so nifty. I love it! I remember my parents coming up from Christchurch and saying ‘it’s the city with everything’, it is.’ Walker enjoys a regular walk up the zig-zag at the end of St Mary Street where he’s living and into the city’s green belt. He says he does this every morning before he starts work and enjoys the view of the harbour. Walker arrived in New Zealand a month before taking up his residency in early April, and took time to travel through the North Island. He began his journalism career on The Dominion newspaper in 1976 before leaving Wellington to work in Australia, and then the UK in 1986, where he worked for The Independent and Independent on Sunday, and wrote for the Financial Times and Granta. 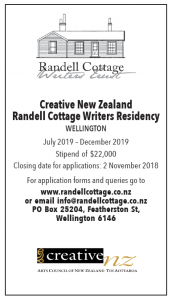 The Randell residency hosts a New Zealand writer for six months over winter, and a French writer over summer. The departing French writer was poet and novelist Yann Apperry.